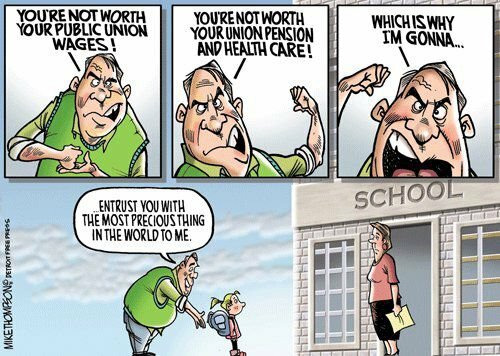 I invite you to take a look and help us explain why educators and other public employees are the enemy? I don’t understand – why am I the enemy? I put myself though college – twice, bachelor’s and master’s – while my kids were little. I worked full time, went to school at night, paid out of pocket, never got a bridge card or unemployment , ADC or welfare. I get up and go to work every morning. I pay a percentage of my healthcare and even pay extra to have my husband covered. I pay into my retirement fund. I pay taxes – income tax, property tax, school tax, sales tax, and registration fees on the American cars I’ve always owned. I had nothing to do with Wall Street scandals or the housing bubble, and my house is now worth half of what I paid for it, but I still pay my mortgage. No short sales, no foreclosures, no sticking it to the banks and taxpayers. Why am I the enemy? [Is it] Because I have worked hard without entitlement programs to get two degrees and a decent job? No CEO bonuses here. Not even a UAW bonus. My kids had to take out student loans for college too – with 10% per year tuition hikes. Because Mom and Dad go to work every day, we’re too “rich” to get handouts. Why am I the enemy again? [Is it] Because my job involves teaching children to read and write and [to] understand math and science, which can’t possibly be complex or demanding? [Is it] Because I provide Band-Aids and pencils and Kleenex and calculators, and wipe away tears and tell my students that yes, they can master fractions if they will just come in early or stay late with me and I’ll help them? [Is it] Because I use everything I’ve learned about brain research in graduate classes to make their learning process natural and fun and exciting, to the point where they think my class is easy? Because I treat them as individuals, and manage to challenge kids who read at a 12th grade level, while differentiating for kids who read at a 2nd grade level, all at the same time? Is that why I’m the enemy? I’ve always worked hard and paid my own way, and yes, I got an A in calculus and I can explain redox reactions and Newtonian physics to middle schoolers. But I’ve never made a fortune, never gotten [sic] a bonus or a company car or cell phone or expense account or incentive trip to the Bahamas. I just work with kids every day. Whoever shows up – hungry, sad, tired, bouncing off the walls – I work with them. I teach them. They know more when they leave my classroom than they did when they came in, every day.